Miami is known for its beaches and its celebrities. The sports franchises in the city are a bit of a sideshow. But that’s how it has always been in beach cities. Look at the Jacksonville Jaguars. They were offering two free beers to anyone that bought a ticket to a game. Similarly, in the sport that’s actually in discussion, the only three MLS teams to have ever folded were all in beach cities. Chivas USA, the Tampa Bay Mutiny and Miami’s very own Fusion. The former was an unfortunate loss and one that is quickly being replaced by LAFC. The latter two were victims of a much more volatile former state of MLS. Which brings us to the question at hand – what makes Miami’s new bid any different? Why would yet another beach-dwelling sports team have any shot at sustained relevance? Well, there are several factors that make Miami FC much different than the Miami Fusion or even the Miami Marlins for that matter. Miami FC plays to the strengths of the city. First of all, it has the celebrity factor already. Look at the owner. David Beckham is the biggest celebrity in soccer. He was the face of MLS during his time playing for the Los Angeles Galaxy and now that he wants to stamp his face on his own MLS franchise, there is plenty of reason to be optimistic. It is the same reason to maintain optimism that LAFC won’t sputter and die like Chivas did. LA is another celebrity city. Conveniently enough, LAFC is boasting a celebrity shareholder of their own, the comedy kingpin Will Ferrell. He has already taken to the microphone to build a following for LAFC and it goes without saying that people are flocking to follow LAFC just because Ferrell told them too. Miami has a much different version of celebrity appeal, but one that is just as effective. Soccer is the ‘cool’ sport in the United States and Beckham is, for lack of a better word, a ‘cool’ guy. Combining the two builds a solidified identity and brands the team in a city that has proven to be like quicksand for sports teams. In one of the ‘coolest’ cities in the United States, MLS has the face of world soccer spearheading an expansion effort. Hard to look at that and think of anything resembling failure. 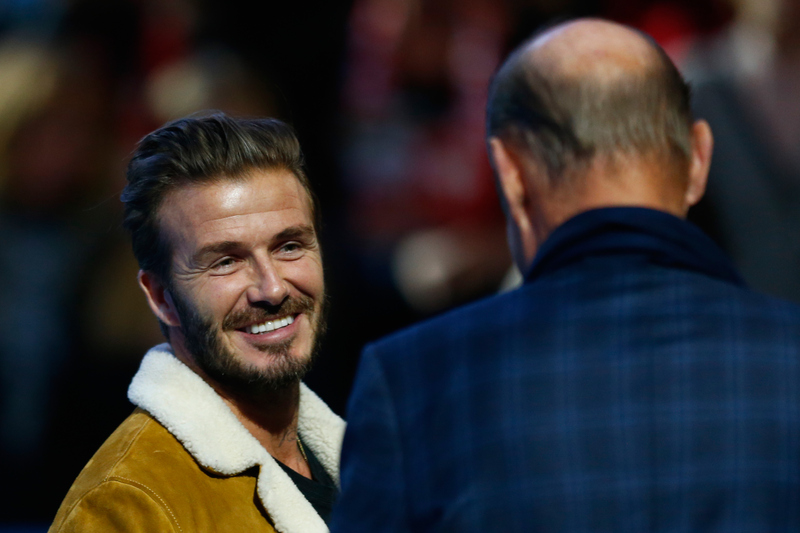 To accommodate the beaches, as well as the downtown and the general social life of Miami, Beckham has made it perfectly clear from the start that he wants a stadium that is on the ocean while still close to downtown. He even went so far as to challenge Royal Caribbean for PortMiami, a seaport which, according to recent statistics, accounts for 175,000 jobs and $18 billion in the Miami economy. That’s how much Beckham valued a stadium on the water. That didn’t work out, and a stadium became a major hold up for the to-be franchise. So much so that the franchise’s proposed inaugural season was on hold until Miami Beckham United, the organization running the efforts, could find a plot of land. That plot of land emerged recently, and the group has purchased it. “We have the right site, the right ownership group, and a loyal base of fans counting down the days until our first match” said Marcelo Claure, a partner of MBU. The location is right next to downtown Miami and is within walking distance from major public transportation systems. The next major obstacle to beach-laden sports is the challenge to establish relevance early on. As mentioned earlier, sports in Miami or Los Angeles can sometimes turn into sideshows if they aren’t competitive. Orlando SC has proven capable of drawing massive crowds right off the bat, so it’s reasonable to think that Miami will have initial appeal right away too, but that doesn’t mean that they can retain that appeal down the road. After all, sports are cool and all, but Miami is a city of foreign denizens. Not many of the cities’ population hail from Miami itself. Former Miami Fusion owner Ken Horowicz cited this as one of the chief reasons why he was unable to build a base in the city. However, even in those unfavorable circumstances, the Miami Fusion were able to up their attendance from worst in MLS in 2000 (7,500) to 11,000 in 2001, when they were dissolved. Luckily, Beckham should have that covered as well. By putting his face all over this expansion franchise, he opens the door for numerous other ‘soccer celebrities’ to make their way to Miami FC. For instance, some reports indicate that Cristiano Ronaldo, the biggest current celebrity in the game, will make his way to Miami FC when it’s up and running. Also consider the fact that Zlatan Ibrahimovic has indicated that he would come to the MLS, but only to three potential locations – Los Angeles, New York or, you guessed it, Miami. Try to think of a better way to sell tickets to soccer in Miami. I dare you. That accounts for two of the three biggest names in the soccer world already making potential verbal commitments to Miami, given the right circumstances. Once Miami gets up and running and Beckham has more time to flaunt his celebrity appeal to high-profile athletes out there. Expect another NYCFC, with three designated players that draw thousands of fans all on their own. But again the irking fact remains that Miami has been here before. So what makes this time so different? Well, aside from David Beckham, the greatest franchise-building resource known to man, Miami FC also has the financial backing of Simon Fuller, creator of American Idol, Marcelo Claure, CEO of Sprint and Tim Leiweke, CEO of AEG. It’s safe to say they have the financial backing to make this team survive where previous attempts have failed. Finally, perhaps the main thing playing in Miami FC’s favor, as it is playing in every other cities’ favor as well, is the state of MLS. When the Miami Fusion folded, MLS was in dire financial straits, cutting from 12 teams down to 10. They were downsizing and the future looked bleak. This is a much different MLS. It is expanding at a rapid rate and support is growing by the multitudes. Most teams are able to draw a steady 20-25,000 on a regular basis. MLS has the financial stability to maintain these expansions and Miami will not be an exception.